Currently full - however our Loft is now available to book - Ocean sounds rolling at night. 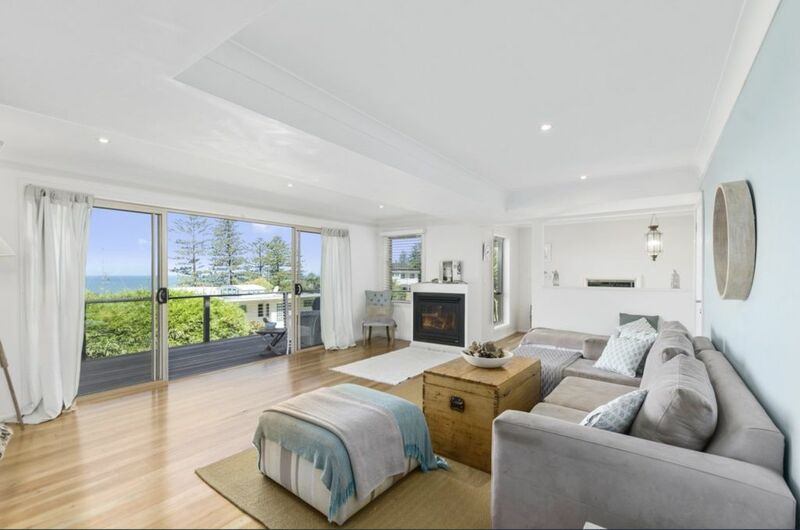 Sea Views & across the road from Sharkeys Beach, on Austinmer boundary, walk down the drive across the road & down the secluded goat track directly to the beach. Modern beachside home with fireplace and large deck. Quality Spa Bathroom, Walk down the drive, across the road to direct local known access to dog friendly beach. Stroll around the corner to little Austi beach or Coledale Beach & beach pool.Three rooms one with two single beds, one with a Queen & one with a double - all fresh quality linen & towels supplied. Coffee machine & coffee & milk on arrival. No TV at property, as it is set up for holidays, however, wifi available if you need to bring your laptop to stay connected. The property has its own entrance, and no stair back entrance. There is a double garage for your private use & one off street parking space. Fully fenced yard for your pet with a pet door to back garden. Great beach holiday lifestyle - growing up here our kids felt like every day was a holiday. Please note there is a quiet couple in the loft upstairs with their own entrance; they look after bins & we ask you not to park behind their car in the drive please. Call the owner regarding any requests as the tenants upstairs keep to themselves. Just bring your beach towels & walk to rock pools and two patrolled surf beaches either along the beach or via the roadside path. A great place for a holiday - we holidayed here for Christmas ourselves every year our children were growing up as so much at your fingertips. Great Cafes, long beach walks, rock pools, Gladstonebury Gardens great for kids. Surf, boogie board, snorkel etc. Drive to Kiama markets, Jamberoo Water Park or walk to local Coledale Markets every 4th Sunday or drive, catch bus to Bulli Foragers Markets every Sunday. HAving loved travelling near beachside properties I appreciate the guests needs and try to make sure all you need is at the property. If you have any problems happy for you to contact me immediately. We fell in love with this property's location - directly opposite Sharkies Beach a little bit of heaven between escarpment and sea. A non patrolled beach means it is not packed yet our puppy could come to the beach with us, rare today. Great surf - yet if we wanted a patrolled swim we could walk 10 mins along the beach to beautiful Austinmer or 5 mins to little Austi beach rockshelf for the kids to paddle in. 150 m walk to the ocean down the local goat track direct access at end of driveway across the road. Down drive across road there is direct beach access via a goat track or walk down the road to the Sharkey Car Park. Beachside Holiday with Massage therapist in house booking appointment available - text Lisa or see the folder with massage therapists mobile no. We thoroughly enjoyed our week at Sharkies Beachouse, starting and ending each day with a visit to the gorgeous dog friendly beach. Our dog Alice was in doggie heaven. Communication with Lisa was very easy, the house was spotlessly clean and the bed was super comfy. We also enjoyed excellent coffee and breakfast at nearby Earth Walker and Mr & Mrs Smith cafés. We spent a week over Christmas 2018 and had a wonderful holiday. The house is beautiful, spacious and, best of all, completely dog friendly. Its large deck was perfect for sitting and looking out over the wonderful view. The close proximity to two dog friendly beaches meant the 'whole' family could enjoy swimming or the taking leisurely walks along the shore. Sharkies beach was especially lovely and close to the property. You know you have found a great place to stay when it is hard to leave! We thoroughly enjoyed our stay. It’s proximity to the beach, comfortable furnishings and amenities made it a perfect home away from home!! "Thanks for being' so welcoming Lisa & Olaf it makes all the difference. We loved our stay and enjoyed all your homely touches like the coffee machine. Great location beautiful area. We will be back. Cheers Tracey & Tim. Opposite best dog beach in the area, near great cafe's, restaurants & famous Sandon Point where Mick Fanning learnt to surf. Great pubs & RSLs. Fab artist area & Coledale & Bulli Markets. Fab fun at Thirroul Festival around April.